The Southern Food & Beverage Museum, Pacific Food & Beverage Museum, and The Museum of the American Cocktail host a variety of programs in New Orleans, Los Angeles, and beyond. See the following schedule for upcoming cooking classes, dinners, seminars, talks, tastings and more. Interested in booking your next private event at the amazing Southern Food & Beverage Museum? Learn more here! Support SoFAB at the April Hobnobber! You are invited to New Orleans Magazine’s Hobnobber! Mix, mingle, sip and socialize with other local professionals. Enjoy complimentary hors d’oeuvres, happy hour prices for wine, beer, mixed drinks & daiquiris, and register to win door prizes. 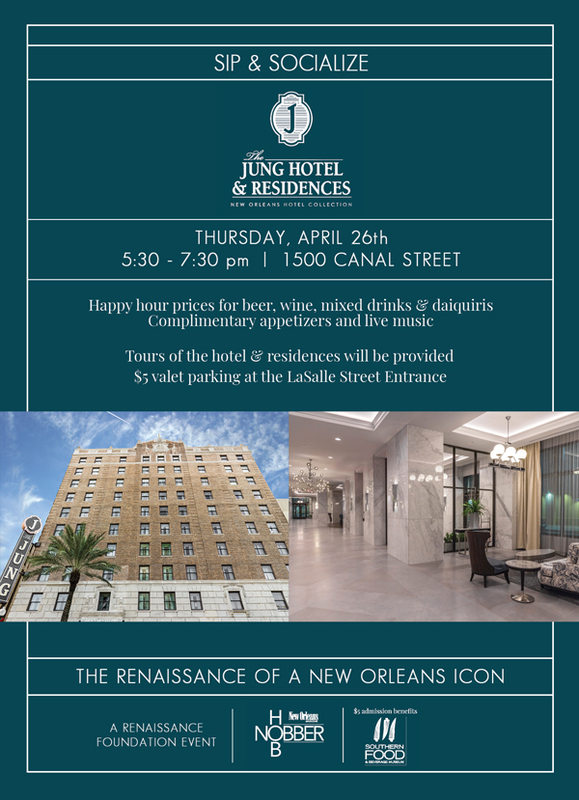 The April soiree takes place at new Jung Hotel & Residences of the New Orleans Hotel Collection, located at 1500 Canal Street. The $5 admission will benefit the Southern Food & Beverage Museum! Dress code is business attire and advanced reservations are required.